8 Steps to Business Brand Social Media Greatness: Be unique, be your authentic self, consult an expert, write a plan, be engaging, be consistent and determined, be in it for the long haul and you’ll be on your way to social media, digital marketing, and business brand success! As a small or medium size business, your to-do list is likely as long as your arm, if not longer. When it comes to social media and your overall digital marketing, it’s no different. In addition, like any aspect of your business you’ll want to to do it well or not at all. To make an impact in social media you need a firm plan and an expert on your team to help you prioritise. So here’s a checklist to bookmark (heck, even print it out and hang it on your wall!) to check off your progress in transforming your business with social media. Social Media strategy with your business is a journey. Yes you should start with a clear plan, but be prepared to shift tactics once you get some solid empirical data. Don’t be obsessed with analytics however, have fun with it and listen to feedback from your colleagues, friends, partners, and even your competitors – yes shock horror, even your competitors! “The big mistake is always to think that human decision making is rational … People are not behaviorally driven by demographics. They are driven by resonant values, metaphors and the emotions these bring.” -John Marshall Roberts, expert in world view thinking. When you’re building an online presence (particularly in the consumer market place) you’re doing more than selling a product or service, you’re creating an identity and personality in cyber-space. It needs to be an intentional orchestration that focuses on the needs, values and desires of your business and the market you serve. You’re not meeting your client face-to-face, and so their unconscious measuring, matching and evaluation process of you and your company needs to be fully understood and your whole ‘look and feel’ needs to be consistent. From the images you utilise and the quality of their production through to the jargon of your content and how easy and straight forward your site is to use – you’re under the microscope. With the growing rate of audio and video channels of social media marketing, you’re not just in business any more – you’re also in show business now. Welcome and good luck! In a few short years we’ve moved from simple ‘online sign-boards’ to full-fledged multi-media productions. In order to reach high end customers and clients, you need to show up in style and on trend. To help you, the key players in Mad Scientist’s creative and marketing team come from the entertainment industry, so we’re ideally suited to helping you demonstrate your star quality online. Marketing Online? Welcome To Showbiz! 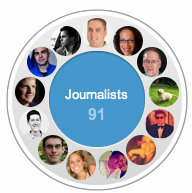 It’s no surprise that Google+ users want to talk about Google+ — and journalists aren’t omitted. Many have been posting tips and tricks for using the media, such as how to get a more accurate circle count and ways to bring your Facebook stream into your G+ stream. Even conversations about Twitter and Facebook seem to steer right back to Google+. For example, Matthew Ingram of GigaOm sparked up a discussion about ads hitting Twitter feeds. While some responses remained on topic, many started talking about whether Twitter users would run to G+ or if Google would begin including ads in streams. As journalists continue to join the platform, growing discussion and collaboration around Google+ as a communications tool will shape the way it’s used for creating and distributing news content. Sarah Hill, an anchor for KOMU-TV in Columbia, Missouri, has been inviting her Google+ fans to join her in Hangouts, the network’s video chat service. KOMU hosts a Hangout during the 5 p.m. newscast to give viewers a behind-the-scenes look at the newsroom. She then interviews people in the Hangout on-air about their reactions to the day’s news. One chat brought in people from Pakistan, New Zealand, Orlando, New York, LA, Missouri, Iowa and England. Hangout participants were floored by Hill’s ability to multitask. Only 10 people are allowed in a Hangout, so spots fill up quickly and some commenters are bummed when they miss out. Still, Hill’s experiment illustrates the reach of the Google+ community. “It’s like we have viewers from around the world on a video speed dial,” she said. Hangouts could be a great way for journalists to get audience reactions to news events in real time or find story ideas by asking Hangout participants what’s important in their communities. Despite Google telling brands the platform isn’t ready for them yet, media organizations have quickly jumped on board. Like many of the early adopters from the journalism world, Canada’s top news source CBC has been posting links to stories with prompts that solicit reader feedback. They truly tested the engagement waters with a caption contest. The contest was also posted on Facebook, Twitter and the CBC website. Fox said she’s seen smart dialogue and a deeper level of engagement with the content on Google+. She and her team plan to avoid replicating their Facebook and Twitter posts, and figure out what works for the Google+ community specifically. With the natural enthusiasm for engagement and intelligent conversation, Google+ could become a place for journalists to generate solid feedback from their audiences. It’s important journalists grasp the full potential of the platform. From there, they can optimize its features to create a social dialogue around news content. Google+ is fostering rich conversation about journalism. It’s cultivating a community of thought leaders who rely on each other for feedback about their opinions on news events and the media industry. When tweeting news commentary, a journalist is limited to 140 characters. Unless the discussion has a hashtag, it’s tough to see the full scope of the conversation as respondents may not be following all involved. With Facebook, conversations on journalists’ personal profiles don’t take off because many don’t friend professional contacts. Even if the journalist has a public page, his or her discussions are competing with updates from their fans’ friends and other pages because of the news feed algorithm. Google+ brings conversations back to the top of a stream when new comments arise. Though Facebook has a number of groups self-organized by journalists, grouping and sharing to professional contacts is more intuitive on Google+. It also seems Google+ posts inspire more engagement than those on Facebook. For example,Mashable started discussions on both platforms about a study that claims 34% of iPhone users think they have 4G. The posts were published at roughly the same time and had similar prompts, posing questions about the study’s results. On Facebook, there were 57 likes and 40 comments, while theGoogle+ post had 183 +1?s and 116 comments. Granted this is only one post of many, but it’s still quite telling. Though starting discussions about the news and their analysis of the news is nothing new for journalists, Google+ seems to be a more natural platform for these conversations. The media industry’s focus on journalistic objectivity makes some reporters more apt to withhold their opinions, beliefs and other details about their lifestyle. But Google+ is about people and has become a place where journalists can let their personalities shine. Amidst the news links and discussions, streams are peppered with jokes, photos and anecdotes about life. Not unlike his Twitter feed, Jeff Jarvis is making people laugh with zings like “LAX Continental terminal isn’t 3rd world, it’s 5th or 6th. Expect to see pigs and goats running through.” Others are re-sharing posts from followers they can relate to, such as Evonne Benedict of Seattle’s KING-5, who was touched by a story from a fellow University of Washington alumnus. We sometimes forget that journalists are people too. Google+ is a good reminder that for media professionals, there’s more to life than the news. Overall, the future of journalism on Google+ has yet to be determined. What are some other ways you’ve seen media professionals using the platform? What effect might it have on the news industry? Image courtesy of Sarah Hill. FaceBook Profile: This is strictly for humans. Hey, that’s you! You’re putting your “Face” on facebook! It’s your picture! It’s your name! It’s your profile! Posting this info makes it easy for you to connect with your friends! You’re posting your status updates, videos, pictures, sending messages, writing on walls, and socializing within the FB environment. For example, here’s my FaceBook Profile Page. Got it? One FaceBook account can create several Fan Pages and assign administrators for different businesses. No need to create separate accounts for each business you rep! But now you want to know — what’s the business advantage of a FaceBook Fan Page? Energizing and Supporting. A FaceBook Fan Page can help a business find its best customers. The business can then energize its best customers to engage in word-of-mouth marketing. Further, a Fan Page can also be a place where customers can support each other. b) support each other with after-visit care. The Dolphin Journeys Energizing + Supporting Example. About 14 weeks ago, I helped create a Fan Page for my client, Hawaii-based Dolphin Journeys. Here’s how the customer self-support function of a FaceBook Fan Page works: when you go on a dolphin or whale tour in Hawaii, you often don’t get a great shot from the boat — maybe you’re too excited or having too much fun! But chances are, someone else on the boat captured a terrific video or photo. When you become a fan of Dolphin Journeys, you can upload your terrific shots — and share them with other folks on the boat. When customers share photos or videos on a Fan Page — they can also spread stories to THEIR friends and families when they return from vacation. And people who didn’t get the shot? They become fans, too — and share the videos, photos, and stories with their friends. And of course, there’s a Wall on the Fan Page where people can write about their experiences — authentic stories that can help spread the word that Dolphin Journeys is a terrific vacation experience. But wait, there’s more! A FaceBook Fan Page also lets you track metrics, so that you’ll know the number of visitors to your Fan Page and their demographic data. You can also incorporate reviews, events, notifications and more into your FaceBook Fan Pages. Worried about administration? Don’t be. You can assign several administrators, so that when you go on vacation, someone else can be in charge of the Page. For many businesses, a FaceBook Fan Page may make a great deal of sense. It depends quite a bit on a) how ready your audience is to participate and b) your business objectives. How has a FaceBook Fan Page helped YOUR business? Social networks have proved to be incredible distribution platforms for real-time news and continue to fascinate journalists as communication tools. It’s no surprise that many media professionals have jumped quickly on the Google+ band wagon to explore its potential for journalism. Some are updating personal accounts while others have created profiles for their organizations. They’re in experimentation mode, testing out which features are most beneficial for messaging and engaging with their audiences. Google+ has yet to be defined. For the news industry, it will become what the early adopters of the field make of it. Here are a few ways we’ve seen media professionals using the platform and what that might mean for the future of Google+ in journalism.